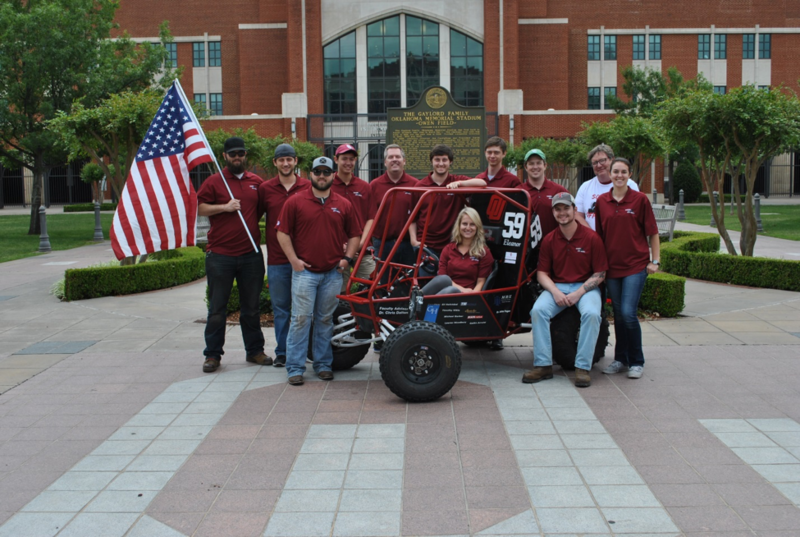 The Sooner Off-Road team competed in SAE Baja, an international vehicle design competition held by the Society of Automotive Engineers (SAE). The team competed against more than 100 teams from around the world to design and create an off-road vehicle accepted for manufacture by a fictitious firm. The project simulated a real-world engineering design project that involved planning, designing, manufacturing, testing, generating financial support, and working with team members who have diverse academic backgrounds. The 2016-2017 team finished 36th place overall out of 110 teams at the 2017 Kansas competition, which is two consecutive years of double-digit improvement in final placement. The team achieved a personal best performance in the suspension event, finishing in 6th place, and dramatic improvements in both the acceleration (30th place) and maneuverability (30th )place) events. The team successfully finished the four-hour endurance race for the second consecutive year. The School of Aerospace and Mechanical Engineering held the annual Senior Design Poster Fair on May 4, 2017. Thirty-eight student teams presented the capstone posters to a panel of judges, who are alumni of AME and industry professionals. The judges determine the overall high scores and the winners of each respective category: interdisciplinary, prototype, studies, testing and vehicle.